Administrators have promised to help place Mother Cabrini students new schools after the 115-year-old high school closes in the spring. 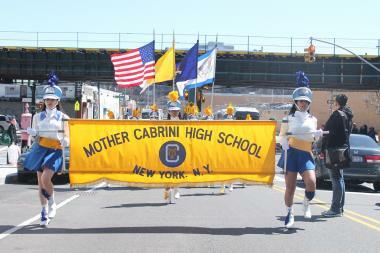 HUDSON HEIGHTS — Mother Cabrini High School will close its doors at the end of the academic year in the face of enrollment and financial problems, school officials have announced. The all-girls Catholic school, located on Fort Washington Avenue just below Fort Tryon Park, is shutting down after 115 years in Hudson Heights. The closing was announced via a post on the school website by school president Bruce Segall and chairwoman Paula Greco-McTigue. In the letter, the administrators blamed the closure on the recession, declining enrollment, maintenance costs at an old school building and the loss of a federal grant. "Our deficit has increased to unsustainable levels," the letter reads. "Sadly, despite increased projections in enrollment, advancement, and rental income over the next four years, this deficit remains insurmountable." Segall and McTigue said that the school, along with the Archdiocese of New York, will help place students in a school of their choice and will help teachers find new jobs. Mother Cabrini, founded in 1899 by its namesake St. Frances Xavier Cabrini, is the second catholic school to close in as many years in Washington Heights and Inwood. Inwood's St. Jude School closed its doors last summer. Four other Catholic schools remain in the area — Good Shepherd in Inwood, Our Lady Queen of Martyrs in Fort George and Incarnation Parish School and St. Elizabeth Parish School, both in Washington Heights. School officials did not immediately return calls for comment.